771. catur-mUrtih – He of FourForms. The nAma means He of Four Forms. Different vyAkhyAna kartA-s have anubhavam of His four folded-ness in differentways. SrI bhaTTar comments that the reference to “Four Forms” immediatelyreminds one of the four vyUha forms (vAsudeva, sa’nkarshaNa, pradyumna, andaniruddha). These four vyUha forms preceded the vibhava incarnations suchas rAma, kRshNa, etc. Even in His vibhava form as Lord kRshNa, He had fourforms, in the forms of balabhadra, vAsudeva, pradyumna, and aniruddha (balabhadrais the elder brother of kRshNa, pradyumna is His son, and aniruddha is Hisgrandson). Similarly, in His incarnation as rAma, the four brothers (rAma,lakshmaNa, bharata, and Satrughna) originated from the same pAyasam that wasgiven to daSaratha at the end of the putra kAmeshTi yAgam. - In the process of creation, the first tattva is called avyakta, the stateof mUla prkRti before it started evolving. - virAT refers to the sthUla form of the evolved state of mUla prakRti,before bhagavAn entered it in the form of antaryAmi and made it functional. - The turIya state is the one that is beyond the three states above, and iscalled parama pursha or purshottama. This is the state in which everythingis contained in Him, and He alone exists, with His Supreme effulgence, beforethe jIva-s get their forms etc. white in kRta yuga, red in tretA yuga, yellow in dvApara yuga, and dark (black)in kali yuga. He also refers to the four states of the self – the wakingstate, the dream state, the deep-sleep state, and the Pure Self state. Inthe microcosm, these are called viSva, taijasa, praj~nA, and turIya, and in themacrocosm, they are called virAt, hiraNyagarbha, ISvara, and paramAtman. This latter is similar to the interpretation by SrI Sa’nkara. Again, SrI rAdhAkRshNa SAstri describes the terms viSva, taijasa, prAj~na,and turIya. 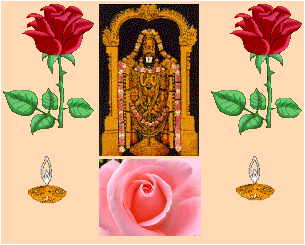 SarIram has three aspects to it: sthUla, sUkshsma, andkAraNa. sthUla is the external appearance, with a shape and a form. sUkshma aspect refers to manas, prANan, etc. The kAraNa SarIra aspect isreflected in the memories acquired from previous births. An example ofthis is the knowledge that a child has as soon as it is born, that by crying itwill get milk, by sucking at the mother’s breast it will be fed, etc. The viSva, taijasa, and prAj~na are the states of the jIva associated with thesthUla, sUkshma, and kArANa SarIra-s. These are also associated with theperson in the waking, dream, or sleep states. In all the abovestates, the jIva wrongly considers that the sarIra belongs to “It”, and hasthe feeling of ownership for its body etc. When the jIva realizes thetruth and passes beyond this feeling of “I” ness, this state is the turIyastate. This nAma is equivalent to the nAma 142 (Slokam 15) – catur-bhujah. It has been pointed out earlier that SrI BhaTTar interprets different groups ofnAma-s as connected to each other in a string that describes a particular formor incarnation of bhagavAn. nAma 142 occurs in the segment where hedescribes bhagavAn’s vyUha incarnations, and the current nAma (772) is in thesegment where he is having anubhavam of the vibhava incarnation of Lord kRshNa. Correspondingly, his interpretation of nAma 142 refers to bhagavAn's vyUhaincarnation with four arms, and the current interpretation refers to His vibhavaincarnation in His birth to devaki as child kRshNa with four arms. Severalreferences are given under both the nAma-s in support. - “tamasah paramo dhAtA Sa’nkha cakra gadhA-dharah” (SrImad rAmA. - “bhujair-caturbhih sametam” (mahA bhArata moksha. 5.34). “O The Inner Soul of all beings! Please withdraw this four-armed formwithin Yourself. Let not this kamsa that belongs to the asura race knowthat you are the incarnation of vishNu”. nammAzhvAr refers to Him as nAngu tOLan - tiruvAimozhi 8.8.1 (v.v. rAmAnujan). It is as if He has four long arms instead of the normal two, just to embraceAzhVar! “I wish to see You adorned in the same way (as before) with crown and withmace and discus in hand. Assume again that four-armed shape (that is, inthe divine form of vishNu – deva rUpam as mentioned in the previous Slokam), OThou Universal Being with the thousand-arms”. ANDAL describes Him as“Ir IraNDu Mal varait tOL Se’nKaN tiru mugattu Selvat tirumAl” (tiruppAvai30). PerukkAraNai SrI cakravartyAcArya’s anubhavam is that the four armsfor bestowing the four purushAtha-s. It is as if He just keeps increasingthe number of arms as needed, to carry many more weapons to protect His devoteesas occasion demands. Thus, when He came to protect gajendra, He came with eightarms; sudarSana AzhvAr that He carries has 16 arms, and 16 weapons in thosehands (SrI shoDaSAyudha stotram of svAmi deSikan). tiruma’ngai AzhvAralso refers to His four arms in periya tirumozh 8.1.1 – “malai ila’ngu tOLnAngE maRRu avanukku! eRRE kAN”. SrI Sa’nkara points out that the nAma catur-bAhuh is traditionally reservedfor vAsudeva (recall Sa’nkha cakra gadA pANe dvArakA-nilayAcyuta govindaapuNDarIkAksha raksha mAm SaraNAgatam). SrI rAdhAkRshNa SAstri points outthat vishNu is typically personified with Sa’nkha, cakra, gadA, and eitherlotus or dhanus in the four hands. - tam adbhutam bAlakam ambujekshaNam catur-bhujam Sa’nkha gadAyudAryudham (bhAga. 10.3.9). Under Slokam 15, SrI cinmAyananda describes the four arms of bhagavAncarrying the Sa’nkha, cakra, gadA, and padmam. These are meant formaintaining dharma among mankind. The conch calls man to the righteouspath that directly leads to Peace and Perfection, to His Lotus Feet. But most ofus, in the enchantment of the immediate sense-joys, refuse to listen to thesmall inner voice of conscience from His conch. For those, He wields theMace (gadA) very gently, and we suffer small calamities and tragic jerks in ourotherwise smooth existence, in the form of communal, social or nationalcalamities. If still the individual is not listening to the call of the“conch”, then the cakra - the Wheel of Time, annihilates the entire being. The call and the punishment are all only to take man towards his Ultimate Goal,represented by the “padma” in His hand. For the nAma catur-bAhuh, SrI cinmayAnanda’s anubhavam is that the fourhands represent the four factors that together constitute the inner equipmentsin man – mind (manas), intellect (buddhi), thought flow towards objects (citta),and ego (ahamkAra). These are the four agents through which all thephysical activities are controlled, regulated, and constantly commanded fromwithin the body. SrI rAdhAkRshNa SAstri gives the following support:"sattvam rajas tama iti aha~nkAraScaturbhujah (gopAlottaratApini 55). 1. bhun’gte bhunakti iti bhujah; caturNAm dharma artha kAma mokshANAmbhujah catur-bhujah – vishNu is catur-bhujah since He makes dharma, artha,kAma, and moksha to be experienced by the deserved. 2. caturbhyah vedebhyah bhavati iti catur-bhug j~nAnam tena jAyateabhityAjyate iti catur-bhujah – vishNu is known as catur-bhujah since He canonly be known by the four veda-s.
a) He of the form of four Emanations (vyUha forms). b) He Who had four manifestations in His vibhava form (as kRshNa, balarAma,pradyumna, and aniruddha). c) He Who manifests Himself as purusha, chandah purusha, veda purusha, and mahApurusha. d) He Whose Supremacy is established by the four-fold veda-s.
f) He Who has four kinds of greatness (vyUha = mahimA). We dealt with this nAma in Slokam 15 (nAma 140). The root is Uh – vitarke– to conjecture, to reason, to infer. SrI satyadevo vAsishTha gives theexpansion – viSishThA UhA vyUhA – He Who forms Himself into four forms forthe purposes of creation etc. Following is a recap with some additional information, mostly taken from Vol.4 of the Agama-koSa published by the Kalpatharu Research Academy (S. K..Ramachandra Rao), dealing with the pA’ncarAtra Agama. As in the case of the other nAma-s of this Slokam that are common with Slokam15, the first instance of this nAma is explained by SrI BhaTTar in terms of thevyUha incarnations of bhagavAn, and the second in terms of His vibhavaincarnation as Lord kRshNa. a) As part of his description of this nAma in terms of the vyUha incarnations(vAsudeva, samkarshaNa, pradyumna, and aniruddha), SrI BhaTTar points out thateach of the vyUha forms have their own limbs, color, ornaments, weapons,vehicles, banners, etc. These forms are assumed by bhagavAn for the purpose ofmeditation and worship (dhyAna and ArAdhana) by His devotees. The four states ofmeditation that are associated with each of these four forms are jAgrat –Wakeful state; svapna, State of dreams; sushupti – Deep sleep; and turIya –The fourth and Final State. In the Wakeful state, the external senses function;in the svapna state, they do not function, but only the mind is active; in theSleep state, even the mind does not function, and there is only breathing; andin the turIya state, even the breath is suspended. b) For the nAma 773, where SrI BhaTTar continues his description of bhagavAn’svibhava incarnation as Lord kRshNa, the explanation he gives is the four formsof kRshNa or vAsudeva, balabhadra (balarAma, His brother), pradyumna (His son),and aniruddha (His grandson). Just as in the vyUha incarnation, in the vibhavaincarnation also, kRshNa was full of all the six qualities, and baralAma (sankarshaNa),pradyumna, and aniruddha had two of the six qualities dominating. “He Who is known as viSrutAtmA, janArdana, etc., divides Himself into fourforms, and performs the functions such as creation”. c) For the current nAma catur-vyUhah, he uses the generic meaning “manifestation”,and using the aitareya AraNyaka declaration, describes the four manifestationsas the purusha in the body, the purusha in the chandas, the purusha in the veda-s,and the great purusha – SarIra purushaS-chandah purusho veda purusho mahApurushah (ait. AraN. 3.2.9). SrI rAdhAkRshNa SAstri expands on this: purusha orSarIra purusha refers to the soul or AtmA in the SarIra of the cetana-s; chandahpurusha is the AtmA in the form of the correctly pronounced mantra-s; the vedapurusha is the AtmA in the form of the veda-s; and the mahA purusha refers tothe purusha in the form of kAla or Time. d) SrI baladeva vidyA bhUshan gives the explanation that He has this nAmabecause His Supremacy is established by the four divisions of the veda-s – Rg,yajus, sAma, and atharva: caturbhih vedaih vyUhyate pareSatvena vRdhyate yam iticatur-vyUhah. e) SrI satyadevo vAsishTha uses the Rg vedic passage “catvAri vAk parimitApadAni (1.164.45), and interprets the nAma as referring to “four divisions ofspeech”. The passage continues to say “The brAhmins who have understandingknow them”. Ralph Griffith interprets this as a reference to three veda-s, andto ordinary speech as the fourth one. f) The dharma cakram writer gives a different interpretation. He takes vyUhato mean “greatness”, and then interprets the nAma as representing bhagavAnas having the following four mahimA-s: 1. Performing the function of creation,destruction etc., just as part of His leelA-s; 2. Revealing the greatness ofparA-bhakti (extreme devotion) through rAsa-krIDA; 3. The revelation of therelation between jeevAtmA and paramAtmA by being the nAtha simultaneously forinnumerable gopi-s; and 4. The calm acceptance of the curse of gAndhAri relatingto the destruction of the vRshNi race. a) He Who is in the form of the four purushArtha-s.
b)He Who provides the four goals: indra, brahma, kaivalya, and moksha. d) He Who is thegoal of the four varNa-s and the four ASrama-s.
upAsaka abhiyoga tAratamyakRta-kramAt catasrah prAptayah asmin iti catur-gatih. SrI bhaTTar does notexplicitly specify what the four goals are that he has in mind. Two differentinterpretations have been given by the subsequent interpreters. One is that thefour goals are the four purushArtha-s – dharma, artha, kAma, and moksha. b) An alternate interpretation, given by SrI aNNa’ngarAcArya and a fewothers, is that, depending on the merit of the upAsaka, bhagavAn takes theupAsaka to one of the four goals: the position of indra, brahmA, kaivalyam, ormoksham. c) In SrImad rAmAyaNam, hanuman describes Lord rAma to sItA pirATTi with thename catur-gatih (sundara kANDam 35.20 – catur-daSasamadvandvaS-catur-damshTraS-catur-gatih). This is traditionally translatedusing the meaning “gait” for the word “gatih”, giving the meaning to thenAma as “One Who has the four kinds of gaits”. SrI v.v. rAmAnujan refers usto the ARAyirap paDi vyAkhyAnam for tiruppAvai pASuram 23 – ‘mArI malaimuzha’ngil”, for the part “un koil ninRu I’nganE pOndu aruLi”.emperumAn’s naDai is enjoyed in four different ways in SrI ra’ngam utsavam-s.These are the Rshabha gati (the walk of a bull, characterized by pride andexultation), matta gaja gati (the gait of an infatuated elephant, characterizedby majesty), the vyAghra gati (associated with the anger of an angry tiger), andsimha gati (the walk of lordliness associated with its position as the king ofthe four-legged species and by its ability to overpower and conquer the otherfour-legged species). In SrImad rAmAyaNam we have the reference to the beauty ofLord rAma’s gait – gaja simha gatI vIrau SardUla vRshabhaupamau, referringto the four gaits described above. He is the goal of the four stages of lifeor ASrama-s (brahmacarya, gRhasta, vAnaprastha and sannyAsa), and the fourcastes (brAhmaNa, kshatriya, vaiSya, and Sudra), when their respective codes ofconduct are observed. caturNAm ArtAdInAm bhaktAnAm yathA-bhAvam AsryatvAtcatur-gatih. “Four types of men of good deeds worship Me, O arjuna. These are thedistressed, the seekers after knowledge, the wealth-seekers, and men ofknowledge”. c) HeWho has a four-fold manifestation in His functions of creation, preservation anddestruction. e) He Who is behind the functions of manas, citta, buddhi,and ahankAra. f) He Who manifests Himself in four forms to support the jIva inits four states - viSva, taijasa, prA`jna, and turIya. g) He Whos is theantaryAmi of the four types of devotees - Arta, arthArthI, etc. i) He Whomanifest Himself in four kinds of AtmA-s: jIva, antarAtmA, paramAtmA, j~nAnAtmA. We dealt with this nAma in Slokam 15 (nAma 139). The term Atman usuallyrefers to the individual soul, but is also used refer to the Supreme Self (ParamAtman),one’s essential essence or nature, Form, image etc. (VAman Apte’sdictionary). The nAma-s catur-mUrtih (nAma 771 in the current Slokam),catur-AtmA (nAma 139 in Slokam 15, and the current nAma), and catur-vyUhah (nAma140 in Slokam 15, and the previous nAma in the current Slokam) haveinterpretations that are somewhat related. So I am re-visiting all the abovenAma-s here. It has been pointed out in many places before, that a unique feature of SrIBhaTTar’s bhAshyam is that he sees a connection between groups of nAma-s inSrI vishNu sahasra nAmam, and has grouped the 1000 nAma-s into 44 groups, like44 petals of a lotus flower. So in SrI BhaTTar’s bhAshyam, we will see theinterpretation that is most appropriate to the form of bhagavAn that he isdealing with for any instance of a given nAma. For instance, he interprets thenAma-s 123 to 146 in terms of His vyUha incarnations (vAsudeva, samkarshNa,pradyumna and aniruddha), and nAma-s 697 to 786 in terms of the vibhavaincarnation of bhagavAn as Lord kRshNa. So he interprets the occurrence ofcatur-AtmA and catur-vyUhah as nAma-s 139 and 140 in terms of the vyUhaincarnation, and the occurrence of the same nAma-s catur-AtmA and catur-vyUhahas nAma-s 775 and 773, in terms of His kRshNa incarnations. Thus, he uses themeaning “Emanation” or vyUha incarnation in the former instance of the termvyUha, and refers to His four vyUha incarnations for the nAma 139,and deals withwhy He took these forms, for nAma 140. When interpreting the series of nAma-sunder the kRshNa incarnation, he refers to the four manifestations of kRshNa asvAsudeva (Himself), samkarshaNa (His brother), prdyumna (His son), and aniruddha(His grandson) for catur-mUrtih (nAma 771), the distribution of the sixqualities between them for nAma 773, and the meditation of these four forms bythe devotees under nAma 775. The point to be made is that even though the nAma-smay have outwardly same or similar meanings, the interpretation is made withemphasis on different aspects of bhagavAn’s manifestations and guNa-s, andthus the full benefit of the diversity of the guNAnubhavam is provided to us,with no dosham of repetition or punar-ukti. Even though SrI Sa’nkara has not adopted a scheme of interpretation wherehe weaves a thread of connection between groups of nAma-s as a rule (as SrIBhaTTar has done), he also avoids punar-ukti or repetition because this is a an“accepted” and expected trait or lakshaNa of the great vyAkhyAna kartA-s. Heuses different meanings for the words in his interpretations for the twoinstances of catur-AtmA. In the first instance, he uses the meaning “four”,and explains the nAma in terms of four manifestations of His in each of Hisroles of protection, creation, and destruction, based on quotes from SrI vishNupurANam. In the second instance of the same nAma, he views the nAma as catura +AtmA, and gives the meaning “cAturyam” to the word catura, and gives theinterpretation that the nAma refers to His skill in keeping His AtmA or Selfpure from any attachment etc. Similarly, for the first instance of the nAmacatur-vyUhah, he uses the interpretation in terms of the four vyUhaincarnations, and for the second instance of the same nAma, he gives a differentinterpretation, based on the different forms of purusha - The purusha in thebody, the purusha in the chandas, the purusha in the veda-s, and the greatpurusha. For the nAma catur-mUrtih, he draws on yet another aspect of bhagavAn’sguNa-s – His appearing with different colors in the four yuga-s: white, red,yellow and black bodies. With that diversion on how the great vyAkhyAna kartA-s provide us withdiverse anubhavam-s of bhagavAn’s guNa-s and eliminate the purnar-ukti dosham,we will briefly summarize the anubhavam of the current nAma – catur-AtmA. a) As pointed out in the previous paragraph, for nAma 139 SrI bhaTTar givesthe interpretation that He manifests Himself in four vyUha forms – vAsudeva,samkarshaNa, pradyumna, and aniruddha. Here the meaning given for the term AtmAis rUpam, based on the nirukti description – vAsudevAdi rUpatvAt caturAtmA itikathyate. b) For the instance of this nAma in the current Slokam, he gives theinterpretation that bhagavAn makes Himself available for experience of thedevotees both in sthUla and in sUkshma form, in any of the four states ofexperience: the waking state, the dream state, the sleep state, and the turIyastate, depending on the capacity of the devotee to meditate on Him. In dissolution:rudra, yama and others, time, and all creatures. d) For the current instance of the nAma caturAtmA, SrI Sa’nkara views thenAma as catrura + AtmA, where he uses the meaning cAturyam for the word catura.His interpretation here is that He has this nAma because He is skilled inkeeping His AtmA or Self pure and free from attachment etc. – rAga deveshAdirahitatvAt catura AtmA mano asya iti caturAtmA. mano buddhi ahankAra cittAkhyAntah karaNacatushTaya AtmakatvAt catur-AtmA. SrI cinmAyanada givesthe pATham as catvarAtmA as the one corresponding to this interpretation –catvara + AtmA – “The One Infinite Efflugence that expresses Itself as thefour aspects of our inner equipment – antah karaNa catushTaya. f) SrI rAdhAkRshNa SAstri gives a interpretation based on nRsimhottara tApinI.This describes His manifesting His Self in four forms. The first is themanifestation where He supports the sthUla SarIra of the jIva (called viSva), inHis form as virAT. The combined form of viSva and virAT is otA. The second formis where He supports the sUkshma SarIra of the jIva called taijasa, in His formas sUtra. This combined manifestation is called anuj~nAtA. There is third aspector dimension of the soul, which is called kAraNa SarIra (also called prA~jna),which is responsible for memories that are carried over from previous birth,such as the memory of the newborn child that crying will result in its gettingmilk. The manifestation of His Self that supports this kAraNa SarIra of the soulin His form as ISvara is called anu~jnaikarasa. His Self which is past thesethree aspects of the soul, and which is realized through brahma j~nAna is calledavikalpa. The nAma caturAtmA, based on the nRsimhottra tApinI, refers to thefour forms of His Self described above – otA, anu~jnAtA, anu~jnA ekarasa, andavikalpa – atha turIyaS-caturAtmA turIyAvasitvAt ekaikasya otAnu~jnAtranu~jnAvaikalpaih (1.11). The first three forms lead to the fourth form – theparamAtman, through knowledge and realization. In his explanation, SrI Raghavendran associates the viSva form with thewakeful state of the jIva, the taijasa with the dream state, the prA~jna withthe sleep state, and the turIya with the state that is above all the otherthree, the moksha state. caturNAm Arta arthArthi ji~jnAsu mumukshUNAm AtmA antaryAmI priya iti caturAtmA. SrI satya sandha yatirAja gives an interpretation that is based His being thecause of the four types of desires in the devotees: caturshu dharma artha kAmamoksheshu janAnAm yogyatAnusAreNa AtmA mano yasmAt sa caturAtmA. h) SrI satya sandha yatirAja also gives another anubhavam: BhagavAn is calledcaturAtmA because He created the fit being for purposes of creation, in the formof brahmA - caturah kuSala AtmA catur-mukho yasmAt iti caturAtmA. i) Another of SrI satya sandha yatirAja’s interpretations is that bhagavAnhas the nAma caturAtmA because He has all the qualities of the four types ofAtmA-s: AtmA, antarAtmA, paramAtmA, and j~nAnAtmA (catvAra AtmAnah – AtmA,antarAtmA, paramAtmA, j~nAnAtma lakshNA yasya iti caturAtmA). a) He Who gives expression to the four vyUha formsthrough four kinds of actions. b) The Source of the four – varNa-s, ASrama-s,pururshArtha-s, etc. c) He Who created the four kinds of species. The root from which the word bhAvah is derived is bhU - sattAyAm – to be,to live, to be born. SrI vAsishTha notes that the meaning for the word bhAva canbe “One who exists, one through whom existence takes place, one who came intoexistence by himself, one who makes others appear”etc. vAsudeva – sRshTi, universe creation; sa’nkarshaNa – sthiti, keepingthe universe in form; pradyumna – rakshaNa, protection; aniruddha – sAstrapradAnam – bequest of a good number of instructional scriptures as guides forliving. abhivya’njanam – manifesting, revealing. dharam artha kAma mokshAkhya purushArtha catushTayam bahavati –utpadyate asmAt iti catur-bhAvah. “The system of four stations was created by Me according to distinction ofguNa-s and karma. Though I am their creator, know Me as non-agent and immutable”. c) SrI satyadevo vAsishTha gives the interpretation that the current nAmasignifies His creation of the four kinds of species: svakRtavyavasthayAcatur-vidhAm sRshTim utpAdayati – One Who has created the four kinds ofspecies through His own Free Will. The four species are: those that come from anegg, such as birds, serpent, etc. ; the humming kind, such as the mosquito, bee,etc. ; the species such as trees, and the human species. a) He Who is known by those who are learned in thefour veda-s.
b) He Who is the Knower of the four veda-s.
c) He Who makes itpossible to know the four veda-s. Literally, the term catur-veda-vit refers to one who is an expert in all thefour veda-s. This unequivocally applies only to bhagavAn. Other who are learnedin the four veda-s, see but a drop of the Great Ocean that He is, because themagnificence displayed in the vyUha and vibhava is vast like the ocean, whichcannot be comprehended by anyone. a) nammAzhvAr addresses Him as “maRaiyAya nAl vEdattuL ninRa malarc cuDarE”in tiruvAimozhi 1.3.10 (SrI v.v. rAmAnujan). To know Him as He is in paramapadam is extremely difficult, to say the least. But in His vyUha and vibhavaincarnations, with His Grace, a tiny part of His mahimA can be realized. b) SrI Sa’nkara’s vyAkhyAnam is that He has this nAma because He is theOnly One Who knows the meanings of the veda-s as they are - yathAvat vetticaturNAm vedAnAm artham iti catur-veda-vit. SrI rAdhAkRshNa Sastri comments that not only it is true that He alone knowsthe four veda-s completely and with their correct meanings, but He is also theveda-s Himself. Thus, knowing Him is only possible for those who have learnedthe veda-s correctly and with their true meanings. SrI cinmayAnanda commentsthat a student of veda can be considered to have achieved his study’sobjective only when he has realized the Lord. c) SrI baladeva vidyAbhUshaN has a different anubhavam of the nAma –bhagavAn has this nAma because He is the One Who enables His devotees to knowthe four veda-s – caturo vedAn vedayati bhaktAn iti catur-veda-vit. In otherwords, only through devotion to Him will a student of veda be able to know andunderstand the veda-s and their meanings correctly. a) He Who manifests only a part of His mahimA when He takesincarnations amongst humans. b) He Whose manifestation in the form of thisUniverse is only one-fourth of Himself. (Both SrI satyadevo vAsishTha and SrI kRshNa dattabhAradvAj give the mantra corresponding to this nAma as eka-pAde namah). The word pAda refers to a quarter of anything (one-fourth), or to the foot.Generically, the term is also used to ‘a part or a fraction’ of something. a) SrI bhaTTar gives the interpretation that bhagavAn chooses to show only apart of His greatness when He takes incarnations amongst us. (This does not meanthat He actually has only part of His mahimA during the incarnations. He has Hiscomplete and undiminished attributes at His command, but He just does not invokethem or use them. This is revealed in SrImad rAmAyaNam, where Lord rAmaemphasizes that He is only a human – aham mAnusham manye), even thoughviSvAmitra and others know His true Nature. See svAmi deSikan’s description ofthe six rahasya’s of His incarnations in Slokam 17 of SaraNAgati dIpikA, whichhas been described previously). “OBrahmarshi! This incarnation of the Lord as kRshNa in the yadu race is only asmall part of Himself”. “He hascome down to this world only with a part of a part of Himself”. “rAma,the delight of the ikshvAku race, took birth as half the amSam of vishNu”. In his purusha sUkta vyAkhyAnam, SrI K. SrInivAsa aiye’ngAr gives theinterpretation that the leela vibhUti which is expressed in His manifestationthrough this universe is only a fourth of His mahimA. The remainingthree-fourths is found in parama padam in His nitya vibhUti. The reference toone-fourth and three-fourth here really are parts of His immeasurable mahimA. “But of what use to you is all this extensive knowledge O arjuna? I standsustaining this whole universe with a fragment of Mine (My power)”. All the thousands of universes together are nothing more than a tiny part ofHim. c) SrI satya sandha yatirAja bases one of his interpretations by looking atthe nAma as ekapo + at, and using the root at – sAtatyagamane – to goconstantly (atati). His interpretation is “ekapo mukhya pAlakah san atati”– He Who is constantly on the lookout as the Sole Protector. The root pA – rakshaNe – to protect (pAti – protects), also suggeststhat the nAma can be viewed as meaning that He is the Sole Protector.